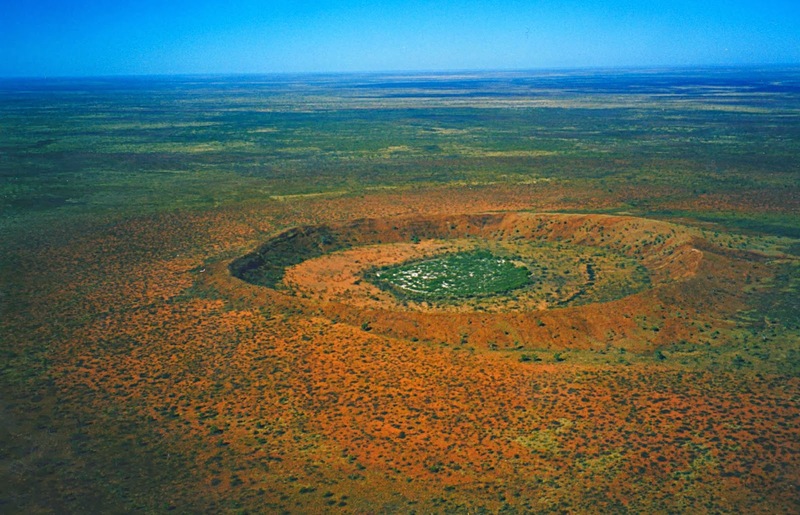 I heard about Wolfe Creek Crater on a holiday in Perth. I visited the exceptionally interesting Western Australian Museum and saw amongst the bits of crashed Skylab, gold nuggets and dinosaurs, a display about the first expedition to Wolfe Creek crater in 1949, where a meteorite had crashed into the northern Tanami desert 300,000 years ago. It is the biggest and most recognisable crater in Australia, and was only discovered in an aerial survey in 1947. It is rarely visited as it is, well, remote. On the edge of the Kimberly region, almost as far away from a major city as you can get in Australia. Definitely fitting into my requirements for a Far Flung Place. To get to Wolfe Creek required a flight from Sydney to Darwin. I managed to bag a special, and then onto Kununurra via Air North, a small regional airline which cost as much as the much longer leg from Sydney. The roads in this part of Western Australia are mainly dirt, and difficult to traverse after rain, so I hired a Toyota Landcruiser, a reliable tank of a vehicle that I had used in exploring East Arnhem Land. The drive down to Halls Creek, the nearest town of any size to the crater, was paved and easy, from then on it would be desert. I will not win any Western Australian Tourist Awards for describing Halls Creek. A real dive, where the relationship between the desert aboriginals who live on the periphery, and the local residents who live in homes with barred windows, is at rock bottom. I had a terrible sleep at the hotel, as there was a pitched battle between aboriginals almost the whole night, probably fueled by grog, judging by the amount of smashed bottles the next day. Do not stay in any room facing the road, garden facing rooms win out easily. To really appreciate the size, and actual impact of the meteorite, I wanted to see it from the air first. I had not booked ahead, but contacting the local airfield I managed to get a seat on a charter plane from NorthWest Regional Airlines who were to fly over the crater later that morning. The crater was 150 km away, and flying over the desert in a small Cessna, the first thing I noticed was how green it looked, deserts were supposed to be yellow and sandy. Huge, unseasonal amounts of rain were the culprit, which would, I was soon to learn, cause problems with the drive into the crater. The actual crater, measuring 850 metres across, and 50 metres high at the edge, is second in size only to Meteor crater in Arizona. It erupts out of the flat featureless green desert, and the fact that a meteor of 50,000 tonnes had formed this when crashing into earth was awe inspiring. Originally it would have been 200-300 metres deep, and the impact threw material 4 to 5km away from the crater. Now I wanted to visit it.